‘Be happy for this moment, This moment is your life’. Omar Khayyam (1048-1132) Persian mathematician, astronomer and poet. Over the last month or so, I’ve been concentrating even more on my mindfulness practise – and being more in the moment. But, it feels a bit like groundhog day at the moment, Winter (and snow) re-appearing and Spring receding into the distance again (much like it was at the beginning of March). Once again it was a very cold weekend, with snow forcast, so I thought about what I might find the garden; most of the plants are looking a bit sorry for themselves (especially the Camellias) but plenty of bulbs coming up. On Sunday 18th March, there was about 3inches of snow in our garden, the sky was blue, but it was very cold. It certainly concentrates your mind when you have to bundle up in your thickest coat, scarf, hat and gloves (and walking boots), just to explore what flowers are out in the garden. So I dashed out, and I found more than I was expecting. It made up for the pain from my arthritis, which doesn’t like the cold at all. I’ve struggled with the cold, with pain, which makes me tired all the time. That’s probably why it took over a week to write this blog – oh well I’ll try to be quicker next time. This entry was posted in Health and Wellbeing, In a vase on Monday and tagged be kind, bee, cotoneaster, daffodils, happiness, Health and Wellbeing, hellebore, In a vase on Monday, mural, snow, wallflower on March 27, 2018 by Bec - views from my garden bench. 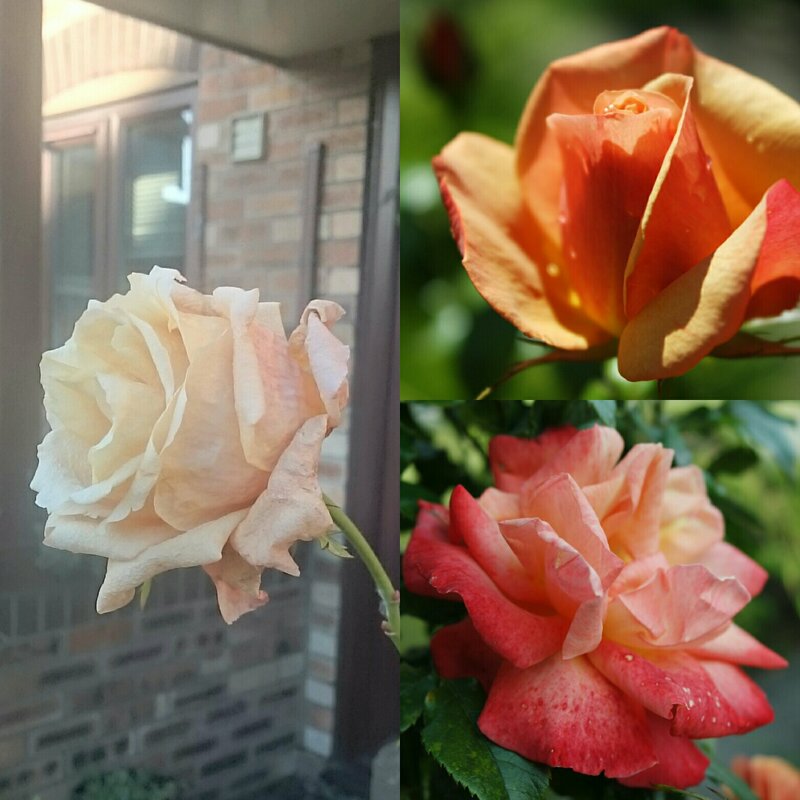 This rose was one of the few plants in my front garden when I moved in eight years ago, it was in a right state. My Chap does the pruning and has certainly revived the rose. I hope flowering in a cold snap, won’t have too much impact on the rose flowering in 2018. 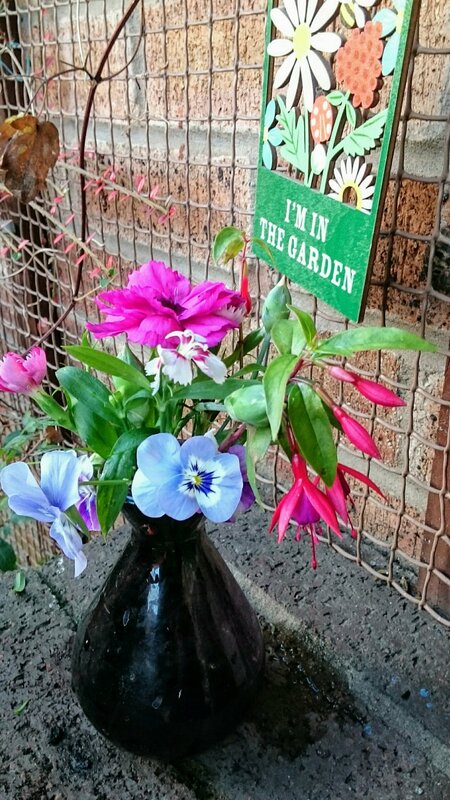 Do check out Cathy’s blog at Rambling in the Garden for more ‘In a Vase on Monday’ arrangements from around the world – some using vases and some not. There’s always something beautiful to lift your spirits. 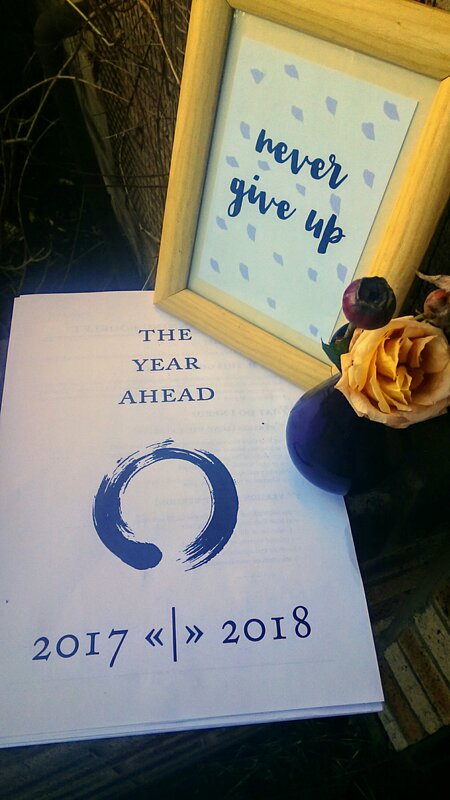 But given what a momentous year 2017 was in both good and bad ways, I decided I needed to find something to help me close off 2017, and help me think though my dreams and aspirations for 2018. I found an excellent short document made by the volunteers of YearCompass and Invisible University International in Hungary. 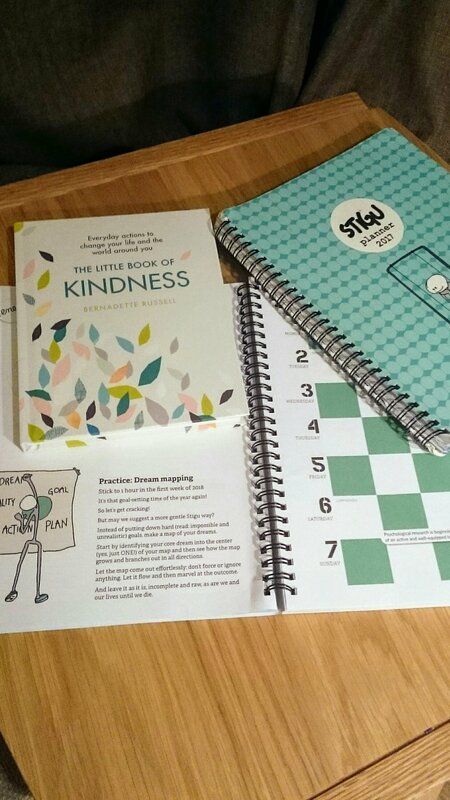 The project began in 2012, is based on psychological theories, has a booklet helping people close their year and plan their next year. The booklet has been downloaded over 400,000 and translated into 22 languages. The booklet is 20 pages and you need a couple of hours to complete for 2017 and about 4 hours for 2018. Looking through the year focusing on family life, work, home, friends, community, Fitness, etc. Looking at decisions, support, gratitude, resilience, challenges and accomplishments. What I want to achieve focusing on family life, work, home, friends, community, fitness, etc. Questions like: Visit three places, three things to do every morning, three things to discover… And many other questions. Pick a word for the year ahead. And you sign ‘I believe anything is possible this year’. It was very illuminating – and thought provoking, and threw up a few topics I’d not really considered. I discussed what I’d written, with My Chap and old friends, who reminded me of my determination and resilience. I’ll be coming back to what I’ve written and the plans I’ve made for 2018. I’ve been doing more of the things that lift me . I’ve been continuing with daily #mindfulness, yoga and #Onehouroutside. #Onehouroutside was started by one of the Outdoor Bloggers Zoe from www.splodzblogz.co.uk. I’m on a roll with one hour outside – I’ve managed at least an hour outside since mid December. I’m making a note in my journal as sometimes walking for an hour isn’t feasible (work or bad weather). It’s been near zero again this week in Manchester, some crisp sunny days with blue skies, alternating with gales and rain. My back garden is a quagmire, but we are fortunate there are Canals and footpaths on our doorstep. My plan for this week is to listen to some mindful walking podcast while I’m out walking. Usually I’m just mindfully breathing, counting breaths and steps, looking around me at the surroundings. As I mentioned last week, I enjoyed the @blurtfoundation Instagram Challenge #blurtmerrycalmness so I’ve looked around for another photo challenge. I found Gaynor Treanor on Instagram who writes about selfcare and mindfulness. So I’ve been following #savouringJanuary2018. What #selfcare have you done today? Have you been kind to yourself today? 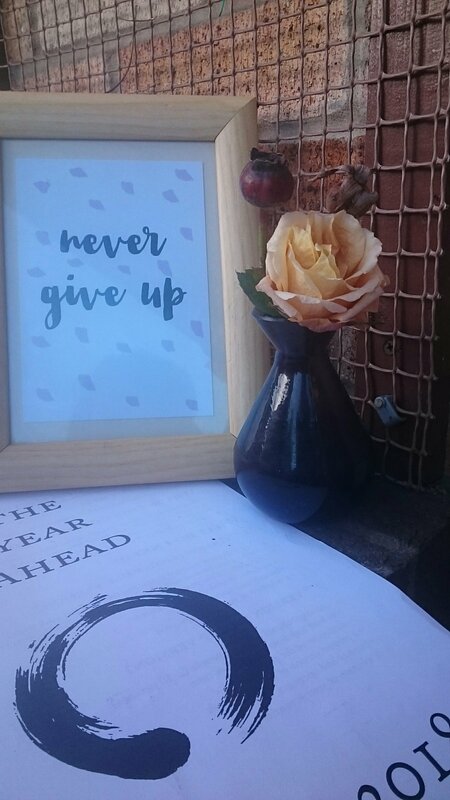 This entry was posted in Health and Wellbeing, In a vase on Monday, Life and tagged Health and Wellbeing, In a vase on Monday, planning, rose, theyearahead, YearCompass on January 9, 2018 by Bec - views from my garden bench. It’s been minus four all day both today and yesterday in Manchester (Mon 11th/ Tue 12th December 2017), it’s been gloomy but a biting wind. For a change, we swerved the heavy snow, hitting the Midlands instead, there was some snow on the hills that ring the city on Friday Night and during Saturday. We rarely get much more than a smattering of snow, where we live in #Monton, as it’s very flat, near canals and rather built up (the ground is too warm for snow to settle). Not that I’ve seen much of any snow, as I’ve been wiped out by a cold and in bed – my arthritis pain was a bit full on too. As usual My Chap has been looking after me 🙂 Still it could be worse, Cathy who hosts In a Vase on Monday at Rambling in The Garden in the Garden has a Vase of snowdrops and rose hips among rather deep snow this week. There are Northern and Southern Hemisphere contrinbutions so there’s always something lovely. The photoframe and card represents DAY 7: WORTHY. I think it’s difficult at times to believe you’re good enough, especially if you’re ill and have long term health conditions. I’ve been working on accepting I’m enough. Mindfulness and affirmations help with this too. 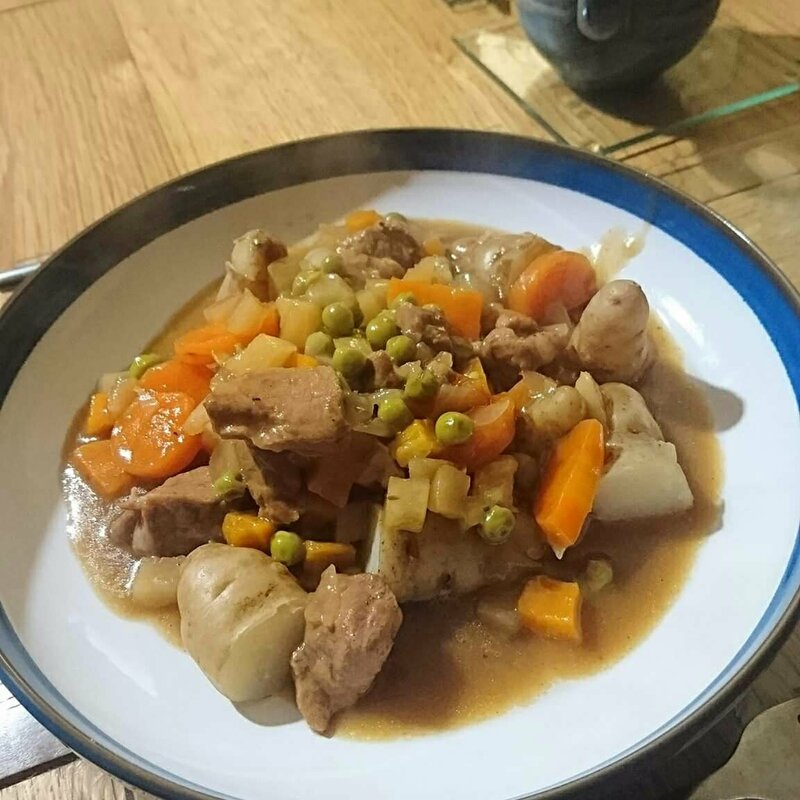 Today’s prompt is COMFORT (DAY 12); it’s a picture of our ramen soup we had for dinner but of course, comfort comes from many things, not just physical aspects of life. Ive spoken before about how much IAVOM helps me – how flowers, plants and the great outdoors lift me. I received these cards as part of my monthly Buddy Box from Blurt. they describe the boxes as a Hug in Box. 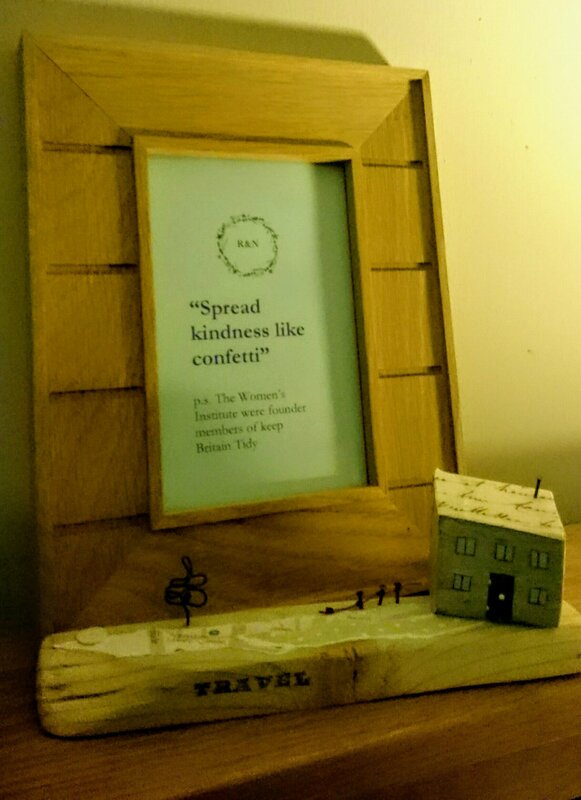 These can be ordered as a one off, monthly, for a friend or send a Random Act of Kindness (Blurt pick someone to receive a box who really needs it). I’ve got much ‘better’ at self-care over the last few years but there’s always new options and ideas. Selfcare, mindfulness, yoga, affirmations are part of my daily life now. I’m on a journey and I’m not at my destination yet. This entry was posted in Health and Wellbeing, In a vase on Monday, Life and tagged #365daysofselfcare, #blurtmerrycalmness, blurtfoundation, Health and Wellbeing, In a vase on Monday, Pelargonium, self care on December 13, 2017 by Bec - views from my garden bench. If you’ve read my blog for a while, you’d notice I like quotes nearly as much as I like taking photos, especially of flowers. One of the reasons, I take photos is to keep a records of things, what’s flowered when, whether it’s early or late, beautiful gardens and views, as well as nature in its widest sense. It helps me remember good times, and also reminds me where things are – literally like the bulbs, but also so I don’t have to remember things in my overloaded brain! A standard size Cerise pink dianthus and some pink and white dwarf dianthus. lilac violas – these were part of our wedding centre pieces. Fuchsia – this is a hardy one which grows outside our kitchen window – it was in a Vase last week. Cathy, who hosts the meme over at Rambling in the Garden, has some stunning orange and white amaryllis this week. I’ve never grown Amaryllis. The idea of IAVOM is to pick, and display, flowers and plants from your garden or locality each Monday. The diversity of vases from across the world is staggering. It’s wonderful to see the Spring across the world in Australia and New Zealand. Just what I need on a freezing cold but sunny day in Manchester. I take photographs of all sorts of other things too, receipts, recipes, books to read, useful websites, notes I’ve made, etc. I find it easier to have visual records, and use journals and lists. I use Trello for electronic lists (I’ll write about that another time) and I’ve got a simple electronic diary shared with My Chap. Writing things down, taking photos and also help with my planning, wellbeing and making memories, as well as self-care. Ive tried out bullet journals but it doesn’t work for me; I think it’s the pressure to complete things everyday. I’ve had it a couple of years, and I dip in and out, using it to inspire activities or self-care depending on what I’m doing. Often, I use the gratitude, highlights and what’s made me feel calm today? 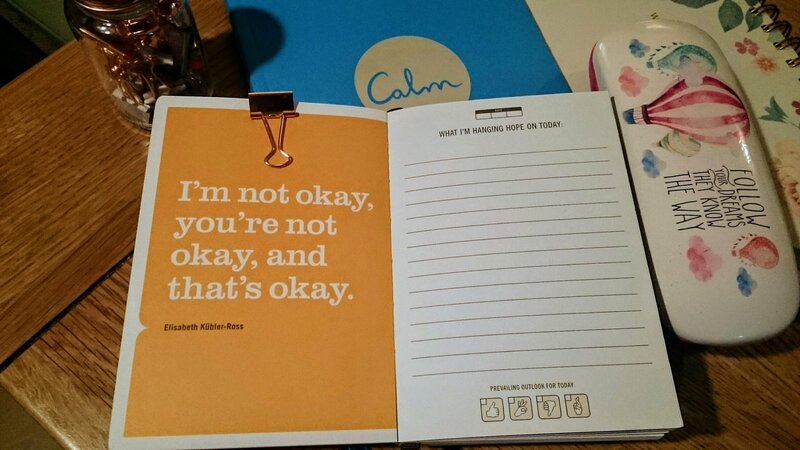 How and note these down in my It’s going to be OK journal. I don’t use the app associated with Calm; mainly because I’ve never got around to downloading it 😦 I’m using the Headspace app at the moment, guided meditations on YouTube, and in particular, guided body scans. These connect well with my yoga practise too. Stigu Journal – a rest and zest handbook I’ve written about Stigu before (including last week) and I’m just starting to fill in my 2018 Stigu. It’s a mixture of a diary and a journal/note book. Each month has a theme – Reflect is November’s theme. The left page is for notes and suggestions for activities. This week’s suggestion resonated with me – a puddle reflecting only what’s above it, for example clouds, and keeping no ‘memory’ of what’s passed. Stigu asks us to imagine what our minds would be like if we could practise this? Weekly Planner – from Sainsburys! It has days of the week, notes and to do list. This is where all the detailed, mind dump, boring lists like the shopping!, reminders for bills, clothes for yoga, etc are recorded. 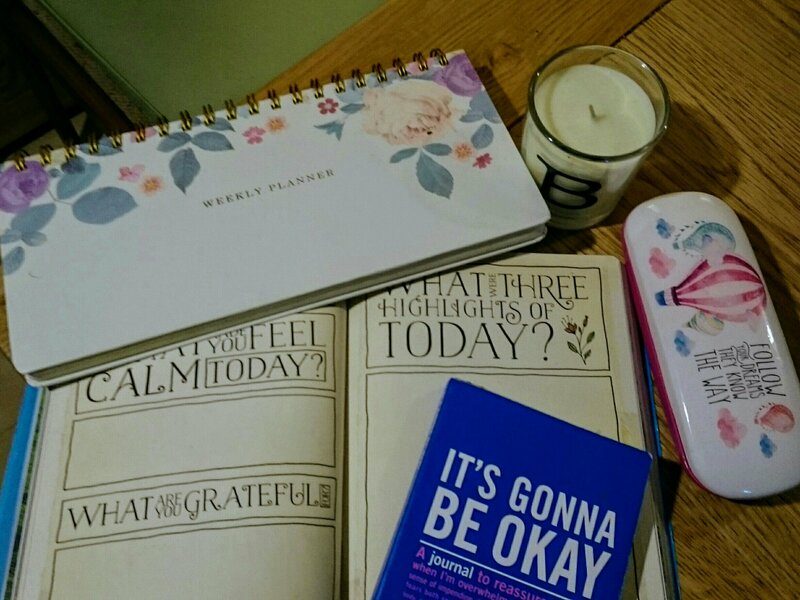 It’s Gonna be Okay – An inner truth journal. As the photos show, this has a quote on one side, date, What I‘m hanging hope on today? prevailing outlook for the day. I use this as reminder of how my days gone, a narrative, notes – what’s gone well what hasn’t. The odd rant too. It’s very much my secret, private thoughts. It has a quote for every day and sometimes I just flick through it looking at the quotes. My Stigu journal and It‘s going to be OK journal also helps me record my symptoms too. I don’t really use paper symptom or habit trackers – pressure to fill in boxes (or not fill them in!). They’re a prompt to monitor my arthritis symptoms in a health app. I was part of a citizen scientist project, in 2017, called Cloudy with a Chance of Pain, which monitored the impact of the weather on arthritis and pain symptoms. The full results should be out next year. So for my #365daysofselfcare today, I went for a walk around Monton. It was freezing, but sunny skies and I wandered around taking photos. Im very grateful to live where I do, close to woods and a canal, yet only six miles to the centre of Manchester. This entry was posted in Health and Wellbeing, In a vase on Monday, Life and tagged #365daysofselfcare, #cloudywithachanceofpain, #journal, #stigu, Cornwall, dianthus, fuchsia, Health and Wellbeing, In a vase on Monday, mindfulness, planning, viola on November 30, 2017 by Bec - views from my garden bench. ‘Hello, Hola, Ola, Bonjour, Hallo, Bongu, Ahoj, Namaste, G’day’ – International Hello Day 21 November was set up in 1973 to promote international peace after the Arab/Israeli conflict. 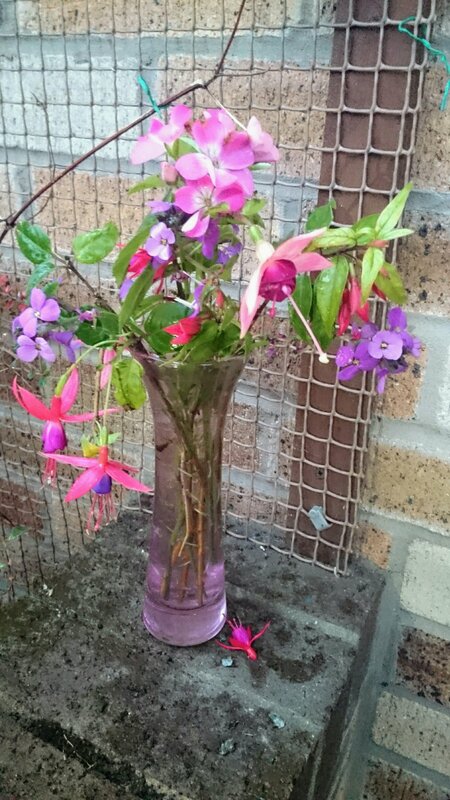 For this week’s vase, between heavy rain, I went looking for the hardy fuchsias in the garden, which have been pops of colour, amoung the greenery. It’s been raining on and off for most of the week. Though we did have a light frost on Sunday, which was just typical as The Chap was up early for a local, muddy, trail half marathon. He let me off going to watch 😉 as my arthritis was giving me gip. I’ve got all the gloves, hats, hand warmers, blankets and thick socks ready for the winter. A spot of Hygge and #selfcare needed. Following on from last week’s post on International Kindness Day, I’m doing my best to be kind to people I know, those I don’t know and being kind to myself too. It can be really difficult to find the time and energy to do #selfcare but it’s worth finding the time even if it’s only a few minutes. It’s International Hello Day (21 November) which stresses the value of communication in daily life, including saying hello to 10 people you don’t know. Its ideals are to encourage greater understanding and peace. #bekind especially to myself – and not to beat myself up about being late/disorganised. Doing some dream mapping from my Stigu Planner 2018 – I don’t do New Year resolutions, I do them in December instead. Finishing our thank you cards from our wedding. It was lovely catching up with people and I’m writing letters about what’s been happening and our plans for 2018 🙂 So many people have supported us though so much this year. I received the book as part of my Buddy Box for September from Blurt Foundation – www.blurtitout.org they describe them a hug in a box. 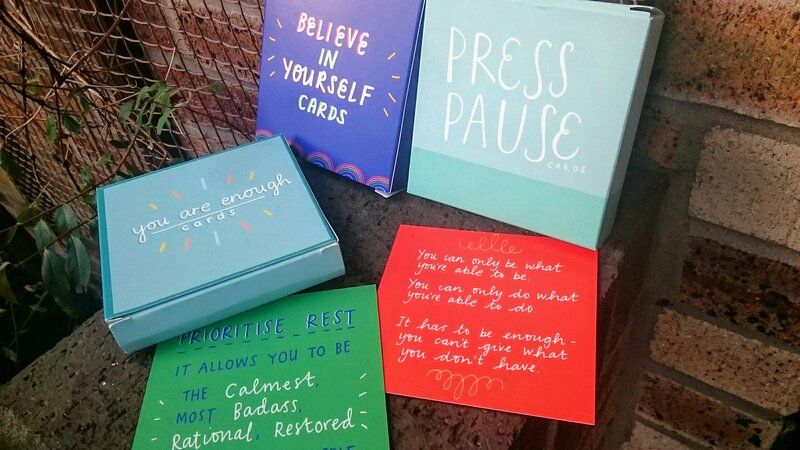 The boxes are great and really lift me; there’s often books on self-care and mental health in the box. And in case you’re wondering the languages at the start are – Spanish, Portuguese, French, German, Maltese, Czech, Hindi and Australian ;-). I can speak varying amount of these languages – but definitely Hello, Goodbye, Please and Thank You 😉 I’ve visited all these wonderful countries and plan to visit again soon. *I paid full price for my Buddy Box from the Blurt Foundation and my Stigu Planner. I haven’t been asked to blog about them or been paid for this content. This entry was posted in Gardening, Health and Wellbeing, In a vase on Monday, Life and tagged #365daysofselfcare, #stigu, fuchsia, Health and Wellbeing, hello, In a vase on Monday, kindness, Pelargonium, planning, wallflower on November 22, 2017 by Bec - views from my garden bench. If you’ve been anywhere near the Internet, or the news, today you can’t possibly have missed that it’s International Kindness Day. I don’t know about you but I try to be kind to people, ‘stand in their shoes’, ‘treat people as you’d like to be treated yourself’… I don’t always get kindness back, but hey that’s their problem not mine. But, what I do know is being kind, helps me be a better person. It also helps when the world around us looks dark, whether it’s Trump, Brexit or people breaking laws. One of the best things I found today was the 2017 Kindness Advent Calendar from Helen at Make Today Make Today Happy. Have a look! This entry was posted in Health and Wellbeing, Life, Women's Institute and tagged #365daysofselfcare, Health and Wellbeing, kindness, random acts of kindness, Women's Institute on November 14, 2017 by Bec - views from my garden bench. Every day submit a picture of what made you happy! It can be about anything or anyone. People can submit photos privately too. My flowers and garden have brought me so much solace this year during such difficult times; my garden has been my sanctuary. The Great Gardens (like Tatton, Helligan, Bodnant and Dunham Massey) we’ve visited have helped too as well, as have all the beautiful flowers from all gardening bloggers across the world. I’ve been getting back into yoga (it helps my back trouble) and have been doing some mindfulness practise too. And of course, my friends and especially my Chap have supported and loved me. I hope doing this will remind me of things, people and experiences that help make me happy. I’m definitely getting back to where I want to be. We had huge amount of blackberries from both my mum’s and my friend’s gardens so I froze some for crumbles and other puddings I decided to have a go a blackberry vinegar; it was very easy to make and it’s hidden away in the cupboard infusing. I’ve got to wait a couple of weeks before the next stage; it will need straining, simmering with some sugar and decanting into smaller bottles and apparently it will last for years. I’ve been doing mindfulness at work (and at home) which is definitely helping. Find out more about mindfulness which is an ancient meditation technique and also how it is used within Mindful cognitive behavioural therapy – http://mbct.co.uk/ and the Guardian wrote about it today (20 October 2015) by Jon Kabat-Zinn, creator of the Center for Mindfulness in Medicine, Health Care, and Society at the University of Massachusetts Medical School who brought mindfulness concepts to the West in the 1960s. I started practising yoga nearly 10 years ago and it has made a big difference to my life. I’ll write about more about yoga another time. My friend C and I have birthdays close together so we usually go out for the day. 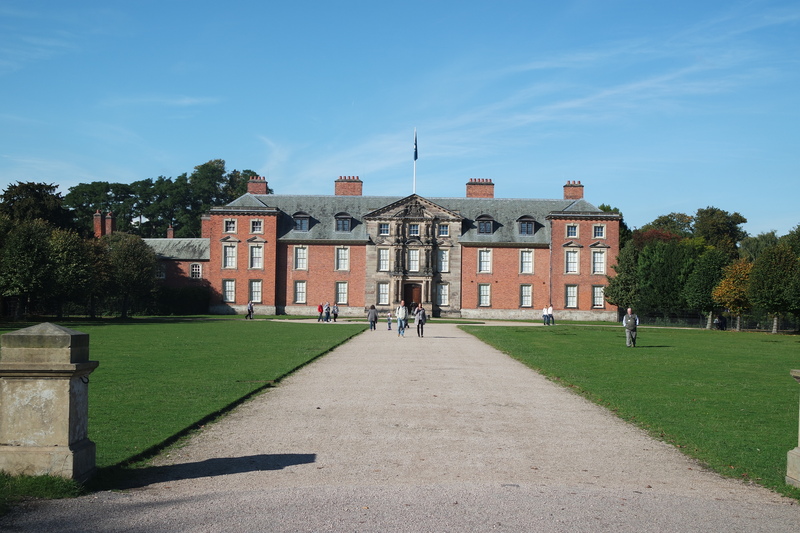 It was a glorious sunny day so we went to Dunham Massey – which is owned by the National Trust. Dunham Massey is a Georgian mansion, near Altrincham with a beautiful garden (including a walled rose garden) a deer park and a saw mill. It’s a wonderful place any time of year, lovely walks too and a lot to see. As you’d expect from the National Trust, it’s got a couple of fine tea rooms and their cakes are great too. Until 11 November 2015 Dunham Massey is Stamford Military Hospital where they have recreated the first world war hospital where over 300 soldiers recuperated from 1917-1919. I’ve been twice – it’s a very powerful evocation of the soldiers’ situations, lives and illnesses recreated with actors. Anyone around the world can get involved in #100happyday or just have a look for the hashtag or on facebook too. What has made you happy today? 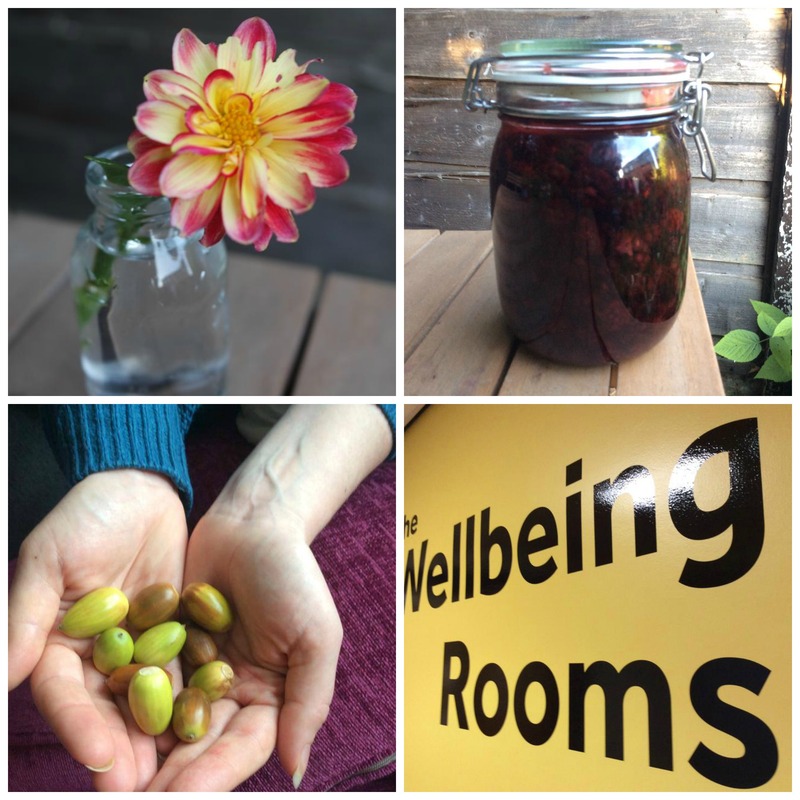 This entry was posted in 100 happy days project, Food and Drink, Manchester and tagged #100happydays, blackberry vinegar, dahlia, Dunham Massey, Health and Wellbeing, mindfulness, yoga on October 20, 2015 by Bec - views from my garden bench.